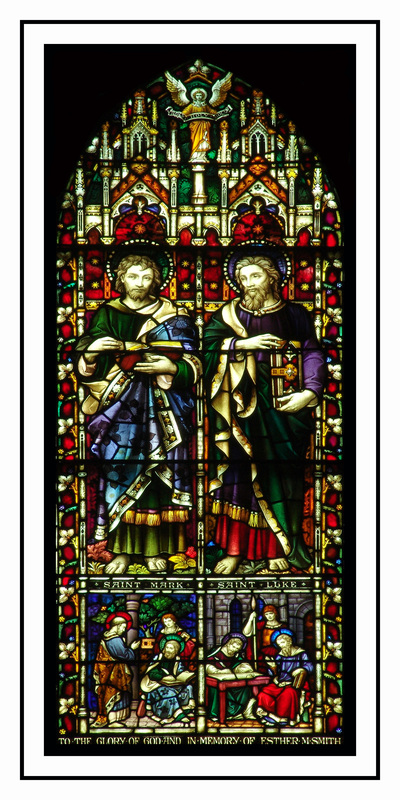 Mark and Luke were both Evangelists, and Luke is credited with writing the book of Acts as well. Both are often shown holding books which represent their gospels. Luke accompanied Paul on many of his journeys and was described by Paul as “the beloved physician” (Colossians 4:14). His legend says he was also a painter, and many portraits of the Virgin Mary are attributed to him, and he is, therefore, the patron saint of painters. He is rarely depicted as either a doctor or a painter, but St. John’s does have a stained glass window showing Luke the Physician. There are conflicting stories of his death: either he lived to be an old man, or he was crucified with St. Andrew. Mark has traditionally be called the scribe of St. Peter; legend says that Peter dictated the gospel to Mark. Supposedly Mark went to Alexandria where he became the first bishop of that city and was martyred. His remains were removed to Venice in the 9th century. The Basilica of San Marco there is one of the great architectural treasures of Italy. The predella (lower portion) of this window shows Mark on the left, writing his gospel which is being told to him by Peter. On the right is Luke, in prison in Rome with St. Paul, where he penned Paul’s epistles. The window was made by Clayton and Bell of London, but there are no records of this window at St. John’s. It is dedicated to the memory of Esther M. Smith, but I don’t know what Smith family she belonged to. Location: South side of nave, upper level (clerestory, second window below the transept. Inscription: To the Glory of God and in Memory of Esther M. Smith.